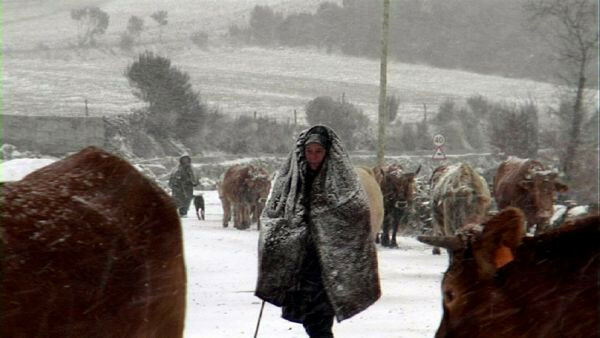 Barroso is an isolated region of Portugal where people live at the rhythm of the herds and the seasons. There, one can witness an ancestral way of life which will probably not last. Everyone knows it is the end of it soon and secretely draws the meshes of sparse memories. The memory resists, the setting serves as a mirror. In reminding us what we used to be, it also reflects what have become. Born 1965, Marseille, France․ Since 1989 Marc Weymuller has written and made feature and documentary films, dealing with absence, with the forms of existence for those marginalized, disappeared and lost. He is currently preparing two films: A Fig Tree without Leaves and Little America. Life, a Long Way Away (2011), Four Walls and the World (2009), Despite the Night (2004), Here and There, Account of a Motionless Journey (1998), The Wait (1996).